Surprised there isn't a thread on this yet already! Was up in Ian Allan the other day and came across this by chance. As with all of Mr Wharmby's excellent publications, what I've read so far has been very informative with a good selection of photographs. If you got the pennies spare, I'd thoroughly recommend picking up a copy. My memories of National's in London are becoming more and more hazy as the years roll by, living in Centrewest territory, they were swept away in my early childhood by Midibuses such as the MA's, but one memory I have (which I've mentioned on the forum quite a few times) is being on a 204 (which later become the U4) and as we were heading along Kingston Lane, we went round a R/H bend, the ticket machine fell off it's mounting and spent the rest of the journey into Uxbridge rolling around inside the front doorwell. I have good memories of using LS to school on the 241 and old 278 around 1990. Really loved these buses they always seemed beefy heavy beasts. I have double memories of Leyland Nationals. Firstly in the North East when they appeared with NBC companies. Northern General took them from the early days but United were much slower to buy them. I can still remember the moment when a brand new one came down the street I lived in (we had a bus route on it) and me dashing out the front door like a demented loon wondering what it was . United and Northern also ended up with some very gutsy National 2s as well. There were splendid versions on Northern's 194 from Heworth to Easington Lane  - a busy route but with some decent stretches where the buses could stretch their legs. In London I used them a lot on the old 230 as it was the only vaguely reliable route on Markhouse Road at the time. I used to get off the tube at Finsbury Park and take the 230 home as a change. We also had a decent contingent at both Leyton and Loughton garages but that evaporated as tendering came in and a move to minibuses. Of course tendering saw an influx of Eastern National examples which I experienced on the 275 from time to time plus an odd one on the EN 251. For a while we also had London Country examples on the old 502/503 into Walthamstow from Harlow. I also think the National 2s that ended up on Red Arrow services were fine vehicles. I know Nationals are somewhat sneered at by enthusiasts and were considered "agricultural" but for all their issues they proved remarkably long lived in service. We still have National bodied Pacers slogging back and forth on rail services across the UK years after the last National bus ran in service so someone got the design right. I missed the 'classic' LS era in London by a fair few years, only knowing the Red Arrow GLS/National 2 refurbs on the 501, 505, 507 and 521. They must have been the last buses in London to carry working fareboxes, into the new millennium - £1 to ride! The overall decor and ambience reminded me of the Leaside (i.e. 253) Olympians - an endorsement, to my mind. I brought the book and read it and as usual, Matthew provides a great history of the type. The P4 used to have some but that was before my time but being a Leyland fan, it was always a bus I wanted to ride and I finally managed to do so at the Epping event a while ago. I may also ride it on the 167 as I hear it will be out tomorrow. On the subject of National's, I got to ride my first one in probably 15 years or so yesterday! Whilst not a London LS, a London & Country SNB was an excellent alternative!. SNB543 is a National I've wanted to get for years, just other commitments have always come up when I've known it was about. After spending over 2 hours on her roaming round the Chilterns, I wasn't disappointed!, brought back a few childhood memories. Loved the Leyland National, then engine always seem to produce a weird sound. The National 2 was scary, sounded like a monster compared to the tickly sound of the National 1. I rather liked the LSs. I always associate them with journeys through the Blackwall Tunnel in the days when that was pretty much the only way of crossing the Thames in these parts. I can almost hear the distinctive 'clack clack clack' noise of the engine and the rattle of the Almex ticket machine. I think some companies took against them because they were so heavily standardised and the internal finish was not exactly laden with passenger appeal. I think they had some teething problems given Leyland's less than stellar standards in the 70s and engineers didn't like the original engine. But they certainly played a huge part in deregulation and became a solid workhorse. LT certainly got their money's worth out of them. I disagree, compared to many other manufacturer single decks the interior of the Leyland National was modern and a fresh approach. The main problem was standardisation and also loyalty to various local bodywork manufacturers. How times have changed. I used to go a far few journeys on the Nationals back in the day. Most memorable was having to get the bus from Basildon to Romford on Burns Day 1990 when high winds knocked out the LTS. Despite the hurricane-strength gusts and bits of trees flying everywhere, it stuck to the road and got me back to Greater London in good time. 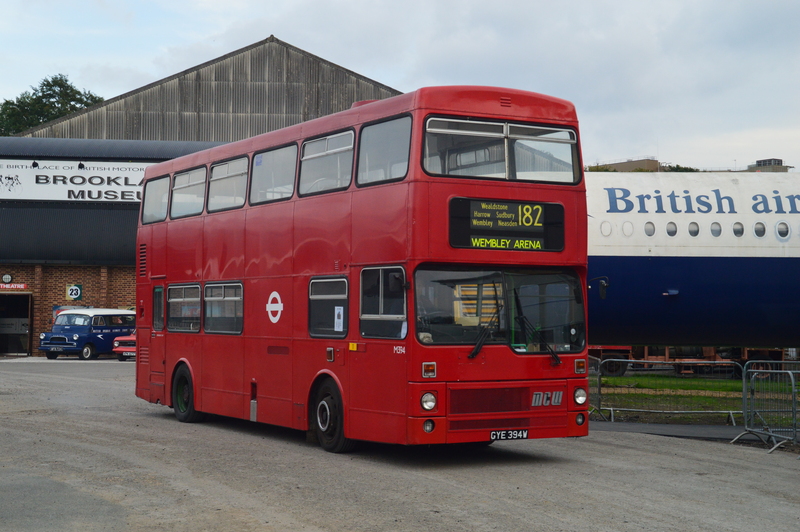 Then it was a Titan on the 87 back home to Barking. When Grey Green introduced Leyland Lynx's on the 179 they were a step down in quality from the Nationals based at Loughton they replaced. They rattled from new and it was a thoroughly uncomfortable ride compared to its cosier predecessor. I like Matt's books, so this will be a purchase for me. I have to disagree, the Lynx's were ferocious rockets, the buses were much warmer than a National in the winter, only downside was the single door. I must have been unlucky, I used the 179 only occasionally in Grey Green days. The Eastern National Lynxes closer to home were horrible, I much preferred travelling on their Nationals. I think your just fond of the Leyland National. I found the Lynx a vast improvement interior wise over the Leyland National. It was also very, very fast. I was not a fan at all over Eastern National (later some part Thamesway) Leyland National's. They had those nasty brown vinyl seats that smelled and were flipping cold in the winter. I was another one who forced themselves to hate the Lynx, made sure I tried my hardest to avoid catching them. Always thought they were an ugly brute compared to the classy lines (as I thought) of a National. Plus they never had that rear pod. Fast forward 20 odd years, I quite like it's styling now, although I still think the Mk.II is a ugly brute. Can't really remember what they were like performance wise (although, only having them on the 607, probably meant they got thrashed hard!) It's a vehicle I hope to get a ride on in the near future. I never liked the Leyland National 2, or Leyland Lynx 2, both were ugly. I also never liked seeing any Leyland National 1 without the roof pod, looked weird.